If you take time to google the term “Anthony Blunt Kincora” it should lead you to a newspaper archive which is posted on the Spotlight On Abuse webpage. You should find the full article of which the snapshot above is taken. 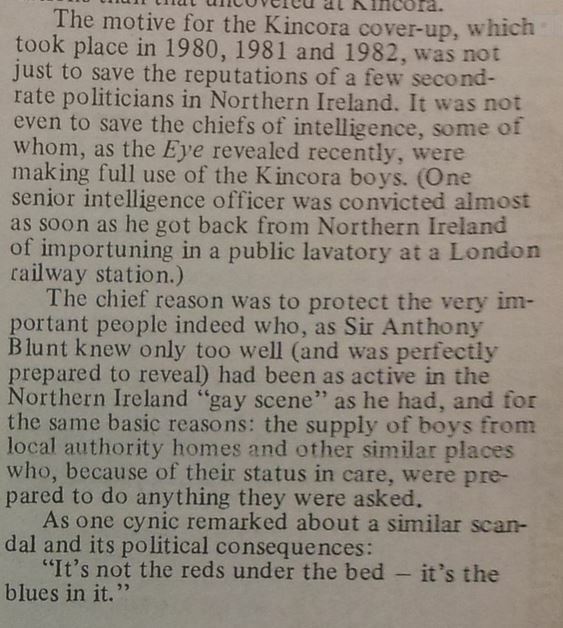 It is most likely an overview of the truth about Kincora put in a pretty concise manner. It also looks like something has caused yer wee woman Theresa May to hit the panic button. Here is a link to her latest outburst. I wonder did Anthony Blunt, William McGrath and Gerry Pinocchio Adams father all know each other? THE TRUE ROCK OR THE “SHAM”ROCK?